Whether you’re new to LinkedIn, refreshing your profile or want to maximise its use, LinkedIn is a great tool for job seekers and candidates. There are a few mistakes that are easy to make, but fixing them can make a big difference. 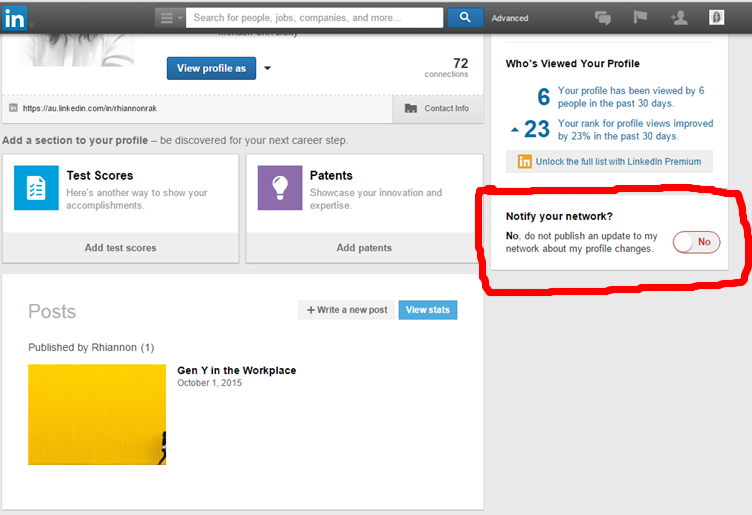 If you’re new to LinkedIn, be aware that there is a setting titled ‘Notofy Your Network?’ This is a really handy tool as a job seeker. If you’re updating chunks of your profile in one go, it’s best to turn this setting to ‘off’. This will ensure your network isn’t ambushed with your updates about your high school or an award you received in 1999. However, if you update your profile picture or change your job title, you may want to turn it on. This will draw wanted attention to your profile, rather than inundating everyone with tiny little updates. The ‘notify your network?’ button is located on the right-hand side of your profile, in the lower section. It’s no secret that recruiters will look at your LinkedIn profile if they’re considering you for a job. However many job seekers’ LinkedIn profiles and CVs are telling different stories. Check your dates at jobs, your titles and general role descriptions. Recruiters may find ‘passive’ candidates on LinkedIn. While you may not be actively looking to change jobs, you may be open to discussing the opportunity. If your mobile number is incorrect or you no longer use the listed email address, it creates an obstacle for recruiters when connecting with you. To avoid this, use a personal email as well as, or instead of, your company email, and always update your profile if you switch to a new mobile number. If you’re unable to finance a professional photographer to capture your headshot, you should still take the time to update your photo. You should be looking professional and employable, so avoid holiday snaps and party selfies. Make sure your shirt is ironed when taking the photo, and don’t be embarrassed to ask someone else to take it for you. Your phone should do the job, but use the back camera, as most front facing cameras are lower quality.It’s best to keep your hair off your face, so avoid side fringes as they cast shadows across the face. Both men and women should try to avoid singlets and cami tops as most workplaces prefer more formal attire. A good rule of thumb being, if you wouldn’t wear it to, say it during or look like that during an interview, don’t post it on LinkedIn. It might be tempting to ‘embellish’ certain aspects of your career on your LinkedIn profile, but it is by no means the smartest thing to do. Reference checks often reveal the truth about a candidate and it’s actually easier for a recruiter to find you a suitable job if they know the truth. So be honest with yourself, and recruiters. What’s the difference between a CV and an Executive Summary?